D &rsquo; an access privileges on the edge of the Gave, face aux Pyrnes, the proximity between &rsquo; Sanctuaries, L &rsquo; htel Our Lady of Sarte &rsquo; profit of a framework and an environment particulirement &rsquo; accueillant. L &rsquo; htel offers 118 rooms, a patio shaded parking intrieur bus and 50 cars mtres, a TV lounge, internet point, 2 lifts, a shop, a bar and a family kitchen 2 treats in our air conditioned rooms. Our htel Meets dernires standards in the field of security. Our 118 rooms are bright, ares, all with bath or shower and WC, direct phone and Satellite TV. &rsquo; Half of them have a superb view of the chane of Pyrnes and the Pic du Jer. They are served by 2 lifts and 6 on rparties levels. Some are perfectly adapted &rsquo; the use of mobile rduite. Our two dining rooms air conditioned, bright and spacious you allow &rsquo; apprcier of traditional cuisine and our family chief. Our 118 rooms are bright, airy, all with bath or shower and WC, direct-dial telephone and Satellite TV. Those on the front have a magnificent view of the Pyrenees Mountains and the Pic du Jer. The rooms are set out on six floors and there are two lifts. Some have been adapted and are perfectly suitable for persons with reduced mobility. Excursions to the Pyrenees or the Atlantic coast can be organised from the hotel. 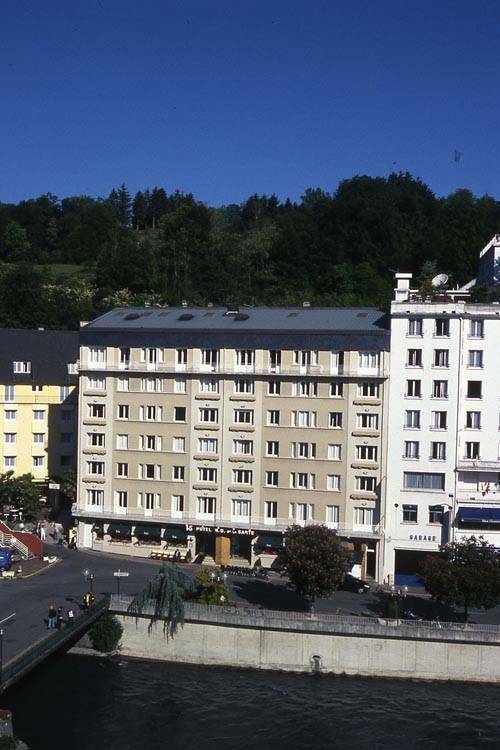 Lourdes, surrounded by the most famous sites in the Pyrenees, the cirque de Gavarnie, the B�tharrame caves, &hellip;is the capital of tourism and contemplation. Our two dining rooms air conditioned, bright and spacious you allow &rsquo; apprcier of the family and traditional cuisine of our chef. Notre Dame de la Sarte Hotel is in a particularly welcoming environment, easily accessible, on the banks of the Gave River, with a view of the Pyrenees, and only 400 m from the entrance to the Sanctuary.